From Kuta we can go to Batu Nampar via Sengkol, Mujur and Ganti. Shortly after the turn of Ganti to Batu Nampar we will find the big village of Batu Rintang. Here are only traditional houses and rice sheds. Only few tourists come here; the residents are very interested in the habits of foreigners. The village across the road has the little friendly name Mata Mailing, ‘thieves eye’. In several parts of Central- and South-Lombok thieves are admired as long as they steal from other villages (often cattle) and share the profit. Stealing dates back from the time that there often was hunger. Smart cattle thieves were proud of their title ‘master thief’. Outside of Batu Nampar are big salt planes and in the bay are the familiar seaweed platforms. Buginese and Mandarese migrants, who rather use the pillar-houses from their homeland, are more usual than the traditional Sasak housing. Some of these houses have beautiful colored, geometrical motives on the walls. 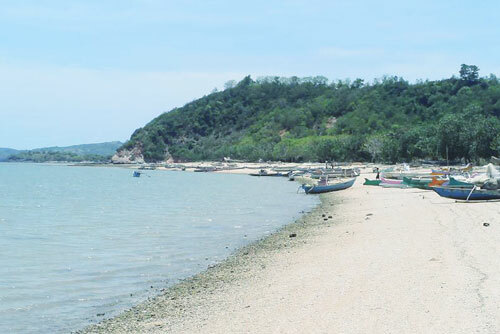 In Batu Nampar we can rend a boat to the other side of the bay, to Ekas village. The trip takes about one hour.